In a world in which our public discourse, our politics and our buying decisions are increasingly shaped online, the humble billboard appears to be making a comeback. In the UK in 2017 the online advertising market was worth £11.5bn and overtook all other forms, according to a government study. Yet UK trade body for the billboard industry, Outsmart, claims that “out of home advertising” (OOH) grew by 5.7% last year to be worth £1.2 billion. Recently billboards and out-of-home media have been used to great effect on both sides of the Brexit campaign. But looking through the details, much of that growth can be put down to the new popularity of digital billboards. Traditional outdoor advertising boards have actually seen a decline in revenue – in the UK at least. But overall the billboard market is a healthy one. And you can understand why: Billboards can quickly give brands national reach at a relatively low cost. They also avoid some of the common (and awkward) pitfalls of online advertising. Being clearly positioned in the public domain means there’s little chance your company’s content will be inadvertently published alongside something offensive or inappropriate, for example. So how can travel agents use out of home advertising to their advantage, and what are some of the lessons we can learn from efforts in the space so far? There are a few reasons why travel brands choose to go with out of home options. For starters, with big billboards comes big space. When you’re marketing a product based on visuals and selling it partly through visual appeal, every pixel counts. And, as we get into below, out of home media also encompasses a range of creative options. These leave room for genuine connections and lasting impressions, both of which are important factors in driving businesses, brand awareness and loyalty. The ‘She’s Back’ campaign from Arthur London won the prize for Out-of-Home (OOH) at this year’s Travel Marketing Awards. Amidst the boom of digital marketing, some traditional media sources have suffered. And there’s good reason for that: digital provides easy-to-report measurements and allows for niche targeting and personalization. Display and social ads offer a low CPM (cost per thousand impressions). But it’s not without its limitations. Bots across social media platforms interfere with and dilute the potency of targeted campaigns, while ad blocking software and banner blindness have become accepted hurdles when it comes to winning new business. The out-of-home industry, however, is gaining traction by working with – not against – digital marketing. The Out of Home Advertising Association of America (OAAA) reports that U.S. out-of-home advertising revenue rose 4.5% in 2018 compared to 2017. The $8 billion OOH industry in the U.S. has seen 35 consecutive quarters of growth. Globally, out-of-home was expected to reach $38 billion last year. Brands are seeing the value in out-of-home and are either coming back time and time again or are beginning to add out-of-home media to their overall strategy. Facebook, Amazon, Apple, Netflix and Google are represented among the top out-of-home buyers in almost every world market. Start-ups Ro, Luminary Media and Eaze have seen success with out-of-home, as well. Small, local and mammoth global brands are leveraging the power and reach of out-of-home (OOH). It’s not a fluke. This growth rate wouldn’t be happening if out-of-home wasn’t an effective marketing media. Marketers wouldn’t keep investing in something that wasn’t working. Old, but not old-fashioned, out-of-home is actually quite the ad trend in 2019. If you haven’t given out-of-home a look lately, it’s time to reconsider how it can help your travel-tourism brand raise awareness and grow bookings. With worldwide opportunities, travel-tourism brands can engage new audiences and reap the rewards of adding out-of-home to the mix. Big. Bold. Oh, and revenue-generating. Out-of-home advertising can cover a lot of things – literally. You can use billboards, mobile billboards, taxi tops, buses, bus shelters, subway cars, stadiums, cinema, airports, mall kiosks or aerial blimps to drive your brand’s messaging. These media formats surround and reach consumers during the 70 percent of their day they spend away from home. These physical media formats cannot be skipped, fast-forwarded through, ad blocked or deleted. They are tangible real estate to promote your travel-tourism brand. Out-of-home media is shown to have greatest impact on awareness, recommendation and purchase-intent metrics. While traditional and digital channels tend to get the biggest share of advertising budgets, it’s out-of-home that is actually driving higher return-on-investment (ROI). According to Omnicom Media Group’s Benchmarketing research, advertisers see a $5.97 return on every $1 spent on out-of-home – higher than that of other channels. In the 2016 Nielsen Out-of-Home Advertising Study, exposure and engagement for out-of-home were quite fantastic. The report shows 91% of United States residents age 16+ could be reached by out-of-home. In the past month, 80% of these U.S. residents noticed an out-of-home ad. The same study shows 82% of billboard viewers make a point to look at the advertising message. This leads to recall…and also action. While no specific research was conducted on travel bookings, these results are promising. The benefits of out-of-home include a widespread reach to raise awareness, the driving ROI factor and the direct-resulting actions taken by viewers. Out-of-home is positioned to offer massive reach within a market. Therefore, travel brands can take advantage of the highly competitive CPM rates this channel generates. What’s more is the way people perceive out-of-home advertising. First, while people are consuming out-of-home media, they’re more confident, excited, hopeful, positive and happy than while consuming other forms of media. Secondly, people trust out-of-home. It’s up there at the top of the list, next to print, for credibility. In public opinion polls, more than 85% of people believe that billboards provide useful information, and 83% find out-of-home informative. Global travel & tourism GDP is projected to grow 4% annually over the next decade. That’s a good sign for travel brands, like yours. However, there are a lot of options for people to choose when it comes to vacation destinations. Out-of-home advertising allows you to influence those decisions effectively. By bringing online statements into the real world, the Led By Donkeys Brexit campaign in the UK has shown how powerful simple out-of-home media can be. Travel-tourism brands are aces at eye-catching creative and are naturally visual storytellers. Out-of-home provides amazing canvases. There’s a synergy for out-of-home that doesn’t always exist so easily across all other verticals. Whether you’re an airline, cruise line, hotel, resort, CVB, destination or other tourism brand, you’re selling travel experiences. An experience that you can use to create mini moments for an audience while they’re out and about. For example, this Travel Wisconsin bus shelter literally gave passersby the opportunity to immerse themselves in a fun moment. More importantly, this creative experience while waiting for a bus also gave consumers a moment to think about what a vacation in Wisconsin may offer them. It connected someone emotionally to this travel brand, as they could imagine feeling the water as they floated inside the visual inner tube. While not as immersive as the Travel Wisconsin example, this ad by Air New Zealand sure is attention-grabbing. Out-of-home placements allow for insanely creative ideas that do get noticed! Not all out-of-home is stand-still, either. Teams of brand ambassadors can personally engage and interact with people on the street. During Olympus Fashion Week in New York City, the City of Las Vegas promoted itself as the “world’s newest fashion capital.” It deployed an interactive team of Elvis impersonators and Las Vegas Showgirls to engage Fashion Week attendees, as well as high-end fashion shoppers along 5th Avenue. The team was able to hand out 10,000 shopping guides and generate earned media. This included user-generated social content and was featured in AdWeek, Media Daily News and other publications. On a similar note, the Tunica Convention & Visitors Bureau unleashed a team of brand ambassadors dressed as doctors and nurses in Memphis. They ‘diagnosed’ Memphians with ‘Tunica Fever’ and passed out ‘prescriptions’ in the form of flyers and premium comps for Tunica-area casinos. The campaign included TV, radio, online and social ads using the same concept. It was a clever way to grab attention and stir excitement to visit Tunica. Unlike out-of-home, there are creative limits to a 320×50 digital ad or an online video. Out-of-home really isn’t one media – it’s many. Artists apply many mediums within the creative, as well – even snow. Our world is pretty cluttered. The creative impact of an out-of-home installment truly can cut through that clutter to make a memorable impression. These bold messaging formats are key in today’s media landscape. Digital isn’t the only data-driven media out there. Location-based marketing leverages mobile data to understand people patterns as they commute throughout their days. This data can then be used as insight into where the best placements are for your travel-tourism messaging. You can start to craft audiences in the real world – and serve them your messages on physical media. “By understanding where people go and how they behave in a typical day, we can use data to pinpoint activities: Where they go, what they’re doing, what sort of apps they’re engaging with,” OAAA CMO Stephen Freitas told Recode in this article. By analyzing anonymous, aggregated data, we can begin to profile consumers – and where they travel throughout a day. Advertisers can start to apply audience segmentation into their out-of-home media campaigns. Today, out-of-home is highly targeted. Some out-of-home media formats give you more flexibility in aiming your message in precise locations to reach the right audience. For example, a mobile billboard follows a prescribed route that is customized to the advertiser and its target audience. It can follow the patterns of your key audience and predict when and where they’ll intercept your message. To promote its BBQ Trail, Alabama Tourism Department declared war. A mobile billboard drove by BBQ fairs and festivals in neighboring U.S. states. It was reaching fans of all things BBQ, who also would enjoying eating BBQ while visiting Alabama. The ad creative reminded festival goers who’s the BBQ King, as Alabama staked its claim loudly. The out-of-home advertising industry continues to leverage technology to remain relevant. This has been attracting new advertisers and allowing optimization across multi-media campaigns. One reason out-of-home has been able to sustain its growth in an ever-changing media landscape is its ability to fortify other media channels. A recent webinar hosted by Geopath and presented by Horst Stipp, EVP of Global Business Strategy at the ARF (The Advertising Research Foundation), explored the importance of multi-media marketing plans. The research presented shows that there is incremental ROI with the addition of more platforms or channels. A 2018 report conducted by Omnicom Media Group’s Benchmarketing found that increasing the allocation of out-of-home, specifically, to the media mix will generate greater return on overall ad investments. Many leading brands will save a small sliver, typically around 5%, of the overall budget to use in out-of-home. But the truth is, brands will see a bigger reward when they re-adjust that allocation to include more out-of-home. As a travel brand, you’re keeping your eye on Google’s travel services, managing several social media platforms and even figuring out where robots fit into your future plans. There are certainly a lot of balls in the air. But knowing that there is one media channel that can increase your reach and amplify your results in all the other channels should allow you to rest easy. Out-of-home lets other media work harder, creating results that are greater than the sum. In this sense, it becomes your campaign booster, supercharging each element in the mix. A USA Touchpoints study shows similar results as the others. Adding out-of-home to other media potentially increases the reach by up to 300%. Lately, a driving factor for out-of-home’s success has been its uncanny ability to integrate with mobile display advertising. When you plan your out-of-home and mobile campaigns with unified creatives and in the same key locations, you see improved performance. Here’s why: the out-of-home message adds credibility and raises awareness, and the mobile display ad reinforces the message and provides a point of conversion. Mobile advertising also supports out-of-home through additional metrics. An advertiser can measure the devices which were close to that ad and then later took an action. We all know that frequency of messaging helps stir consumer action. So by delivering a consistent message across these two widely used channels, you’re stacking the deck in your favor. Ocean Outdoor and NeuroInsights discovered that 48% of people are more likely to click a mobile ad after seeing the same out-of-home ad. Clicks aren’t the only online engagements out-of-home drives, either. Out-of-home has the ability to strengthen the overall media campaign, reach people in the digital age and provide measureable results to advertisers. If you haven’t considered how out-of-home media can benefit your travel brand, perhaps it’s time to think again. Smartphones and Google maps have revolutionised the way we travel. Together they’ve rendered traditional maps (almost) obsolete, put the power of navigation inside everyone’s pocket and connected all of that insight with localised information about things to do, see and experience. But combining GPS with localised maps isn’t always enough for a seamless or ultimately useful experience. We’re all familiar with the little blue dot that pinpoints your location on Google Maps. This process relies on GPS, which in turn relies on the delay of radio signals from dedicated satellites to nail down your exact position. But GPS is fallible. Travellers wandering around big cities: London, New York, or San Francisco, for example, are often left frustrated. How is it that these tech capitals struggle most with localisation? Well, it’s actually really difficult to pinpoint your location when the signals you need to do so are blocked and delayed by tall buildings. Signals get reflected and your access to the sky is limited. The result is something we’re all familiar with, too: Wildly inaccurate placements on the map; your little blue dot in the middle of a nearby river (worrying) or on a completely different street to the one you’re actually standing on (inconvenient and counterproductive). The below image illustrates the signal issues caused in dense urban areas. It’s taken from a post published by Tilman Reinhardt‎, a software engineer at Google Maps. 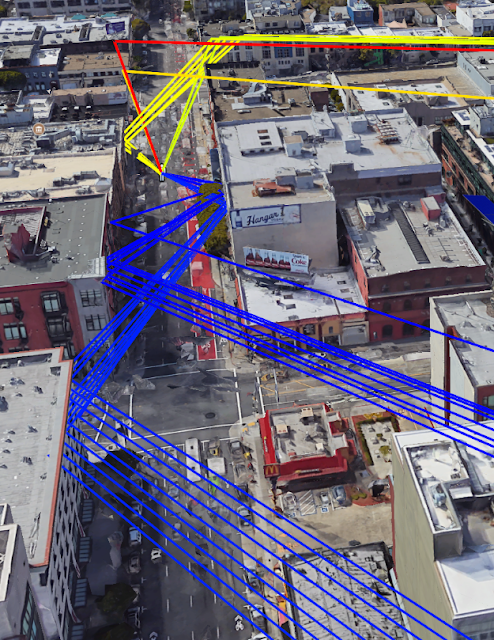 GPS signals bouncing off facades in an urban environment. Apart from generally getting things wrong, GPS has another major limitation that impacts travellers every day: It determines location, not orientation. The direction you’re facing is pretty important when you are exploring a foreign place. It’s no good saying north or south if you don’t know where those are. Travellers don’t tend to carry compasses these days. And the sensors in smartphones designed to provide orientation can often be undone by nearby interference. Google’s solution to inaccurate GPS and orientation is to combine a host of the company’s technologies into one seriously powerful – and rather intuitive – navigation system. Being at the overlap of travel and technology, we thought it would be a good idea to delve into this concept in more detail. So let’s start with VPS, Google’s Visual Positioning System. ‘Visual Positioning’ in this sense is pretty literal. Just imagine you are walking in an area you are not very familiar with or haven’t been to in a while. The first thing we do it orient ourselves with landmarks that are familiar: that church spire in the distance, the McDonalds on the corner, the train station on the next street. Google’s Visual Positioning System is based on this same intuitive method. ‘Global localization’ relies on a combination of techniques and technologies. A key component of the solution is the camera attached to your smartphone. Rather than using GPS, VPS uses imagery to see the world as we do. Its first task is to create a map by analysing your route, taking a series of images which have a known location and analyzing them for key visual features. This might be the outline of buildings or bridges, or other permanent city fixtures. The system then creates a large scale and searchable index of those visual features. Next is the really clever part. To localize the device (and therefore its user), VPS compares the features in imagery taken live from the phone to those in the VPS index. It’s a great concept. The global localization system will have a huge database of images and recognisable urban fixtures. Then, when you’re in a location with GPS instability, it can compare the real world through your smartphone’s camera and use that information to guide you with perfect accuracy. Of course, the accuracy of any system like this is entirely based on the quality of that image database. Where can Google possibly go to get a location-specific database of landmarks and urban areas? We can all remember seeing Google’s odd little cars driving around our streets, mapping roads and building up to the eventual launch of Street View. The option to take a virtual walk on Google Maps has become something we all take for granted. But it’s not that simple of course. When your phone shares live images with Google to try and get a sense of your location, the view will no doubt be different than from Street View’s huge dataset. Think about the angle of the image, the weather and the lighting. The building colours may have changed, too. The challenge is to devise a system that’s able to filter out these temporary changes and recognise landmarks for what they are, no matter the time of day of the minor changes that may have occurred over time. Which is where artificial intelligence comes in. Or to be more specific: Machine learning. “That’s why a core ingredient in this new approach is applying machine learning to automatically decide which features to pay attention to, prioritizing features that are likely to be permanent parts of the scene and ignoring things like trees, dynamic light movement, and construction that are likely transient. This is just one of the many ways in which we use machine learning to improve accuracy,” says Reinhardt. Google being Google, it’s not enough to use Street View, your phone’s camera and machine learning to provide a new way to guide you around locations. The search engine giant also wants to incorporate augmented reality (AR) into the process. If you’re not familiar with AR, it’s essentially the practice of overlaying virtual images onto the real world. Pokemon Go is arguably the biggest mainstream example of it to date. But it’s not restricted to the world of entertainment, as Google wants to show. If we imagine that Global localization will become an additional option within Google Maps that users can turn on when they need it, how does AR fit into the picture? Well, with increased precision comes more possibilities. “One of the newest features we’re testing is the ability to use ARCore, Google’s platform for building augmented reality experiences, to overlay directions right on top of Google Maps when someone is in walking navigation mode. With this feature, a quick glance at your phone shows you exactly which direction you need to go,” explains Reinhardt. That is a nice idea, right? As the original online behemoth, Google is the established point of reference for anybody using the internet. But who could have foreseen that the search engine giant would go from aggregating website searches to becoming a huge player in the global travel industry? As we well know, appeasing Google is key for any successful travel agent, particularly with more trips researched and booked online through computers and mobile devices every year. The company is increasingly packaging its own travel deals as well, rather than simply being a conduit for other agents. But Google is also becoming a major player in the travel experience itself. You have Google Translate – the go-to tool for anyone travelling through a foreign country and trying to pick up the language as they go. You also have Street View and Google Maps: navigational tools that make travel more accessible than it’s ever been before. And now, Google wants to take that to the next level with Global localization, combining existing data from Street View with machine learning and augmented reality to turn your smartphone camera into an active part of the navigation process. No more unstable blue location dots. No more walking up the street the wrong way as part of an annoying orientation process. Just easy, accurate directions. We can’t wait to try it. This deep dive takes a closer look at the social media marketing trends shaping today’s travel industry. How are travel agents using social media to connect with customers? Which social media sites are the most powerful? And most important of all, which techniques are working? This analysis is based on Travel Market Report’s recent Outlook on Social Media. We’ve trawled through it and cut it down to the best bits so you don’t have to. We hope you find it useful, insightful and packed with takeaways that you can start applying in 2019 and beyond. Enjoy! Social Media: The Ultimate Equaliser? When discussing our marketplace software, one theme that constantly comes up is that of competing with the major players. For any agency or tour provider setting up in the travel industry, it’s an uphill battle to even get noticed online. That’s why our proven solution brings smaller providers together in a way that amplifies their reach and evens out the playing field. But social media works in a different way to search engine rankings. On the one hand, huge industry names are more likely to draw a following and, of course, have bigger budgets to push into direct marketing and content production. But on the other hand, the social media landscape is more egalitarian that search engine rankings. That’s because it’s a total equaliser. Everyone starts from nothing and even small travel agencies and tour operators can gain a large, loyal following. So long as they use the platforms correctly. Doing things right is the Holy Grail here. So what can Travel Market Report’s Outlook on Social Media tell us about how travel agencies can position themselves, how brands can rise and fall through social media, and what kind of interactions lead to successful conversations and conversions? The rise of Social Media has led to an interesting challenge for all small businesses, not just travel agencies. How do you strike the right balance between building an audience, projecting your philosophy and being goal oriented: driving traffic to your website, selling, that kind of thing? This balancing act, on top of uncertainty around using Social Media and its tangible benefits, has led to a weird phenomenon around its use for business purposes. For example, the Outlook on Social Media report found that 43% of respondents have a formal social media plan versus 41% who don’t and 16% who weren’t sure. You read that right: Less than half of the travel agencies surveyed have a formal plan in place for Social Media management. However, of those agents who said they had generated $25,000 or more in sales from their Social Media efforts, 59% said they had a social media marketing plan. So what conclusion can we draw from these findings? Well, for starters, they suggest that having a plan is linked to increased sales through social media channels. But we can’t say why for sure. It might be that having a plan means that posts are more consistent, more cleverly targeted and more thought through. Or, it could be that travel businesses that approach Social Media with rigour and thoroughness apply those same attributes with great effect to the rest of their operations. The question of whether or not to adopt a formal Social Media plan gets right to the heart of our uncertainty about using these platforms. Facebook, Twitter, Instagram and the like have been designed to amplify spontaneity. The last thing many travel agents want to do is come across as contrived (and boring). So perhaps that fear is holding many travel operators from seeing the full potential of Social Media marketing. Is your travel agency one the many posting inconsistently, without a formal plan, and unsure over what the aims and aspirations are? Know your intended audience and post with a purpose. In other words, get yourself a plan, or at least an idea of who you want to target and the kind of content they are going to find inspirational. Don’t get caught up in the rush to gain followers. On platforms like Facebook and Instagram, your ultimate goal is always going to be conversions. More followers doesn’t necessarily mean more conversions. What’s arguably more important is engagement. Buying followers or encouraging follower growth through other devious means is self-defeating and not a good way to start. Keep learning. The social media landscape is constantly changing, so you have to adapt and keep up. So do that however you can: attend webinars, read articles just like this one, continue your own research. Whatever it takes to improve your knowledge of the landscape. You might think that SEO – Search Engine Optimisation – is strictly related to the content of your website. But Social Media platforms are part of the internet too, so there are techniques you can apply across the board. The algorithms that determine the content on Social Media platforms are also similar to those that govern Google search results. For example, users on Instagram often rely on keywords to find the content they like and are interested in. Plus, the amount of engagement a post gets will dictate how widely it gets pushed. There is a quite staggering admission from respondents in the Outlook On Social Media survey: 40% didn’t know what SEO is and only 23% apply it to Social Media operations. A related contention was that nearly 60% of respondents don’t use or track hash tags or weren’t sure. As the primary way that people discover content they are interested in on platforms such as Twitter and Instagram, that is pretty unforgivable from a large number of travel agencies. 55% of respondents who said they had sold at least $25,000 via their social media efforts do use hash tags. #TheProofIsInThePudding. The running theme here is that travel agents and advisors are perhaps not taking the potential of Social Media marketing seriously enough. That is borne out in our next statistic. Just over half (51%) of agencies use the analytics provided by social media to gather information about their target audience. And only 37% of travel advisors use analytics to gauge the effectiveness of their own social media efforts. Social Media is crowded and competitive space, so keeping tabs on your methods and results is the only way you’re going to improve. Best of all, every platform provides insights and metrics into the performance of your posts, so there’s no excuse not to test and track your results. What Type Of Social Media Posts Appeal to Travellers? We’ve written at length in the past about Social Media tips for professionals working in the travel industry. We’ve also discussed the power of an effective video strategy and the impact of video content from a content marketing perspective. There are few industries as reliant on visuals than travel. Beautiful, aspirational photos and videos are often what it takes to push travellers toward a particular destination and make a sale happen. They are the means through which a compelling story is told. The proof is there for all to see. Posts on platforms like Twitter and Facebook tend to receive more engagement if images or videos are included. While videos on landing pages can increase conversions by up to 80%. More than two-thirds of agents (68%) who responded to the survey said they use video in their social media. Significantly, around 79% of those respondents who said they had sold at least $25,000 worth of travel via social media in the past year said they use video. So what about the general theme of posts? What have travel industry professionals found to be the most effective? As you’d expect, at the top of the list are the most visual posts: Photography from the travel of agents themselves (65%) and beautiful travel photography (63%). But then there are more conventional marketing tools: 62% of agents found special offers to be an effective form of content. Interestingly, it appears as though travellers aren’t so keen on hearing about practical things or negatives. Only 28% of agents found it effective to post travel alerts about weather or other disruptions. A running theme through Travel Market Report’s research is that many industry professionals aren’t exactly sure what they are doing on Social Media, what their aims are and how to measure success. It would appear as though we are in an experimental phase at the moment. agencies said they have been able to generate at least $100,000 in sales through Social Media efforts. 33% of advisors claimed that using the platforms available had resulted in at least $25,000 in sales over the past 12 months. But there’s an interesting difference here with agencies, of which just 25% achieved similar results. This could be because the role of travel advisor is relatively new compared with an agency, and that the advisor service is more relatable and easy to target towards Social Media-savvy travellers. The discrepancy between there being money to be made via Social Media and a lack of professionals actually tracking sales can be partly explained by our next statistic. When asked about their Social Media objectives, this is what respondents had to say. As you might expect, gaining new customers was the number one reason that advisors (87%) and agencies (86%) use Social Media. But for agencies, it’s also about ‘building awareness and positioning expertise’ (82%). Marketing to existing customers (77%) took the second spot for advisors. In total, around 50% of respondents use Social Media as an advertising platform with specific objectives in mind. All of which suggests there is are myriad reasons to be active on Social Media if you are trying to sell travel. The breadth of those reasons may explain the lack of focus towards either one in particular. Not to mention the fact that these platforms offer a place where you can do all of those things and more simultaneously. Which Platforms Are Proving Popular? One major question that travel professionals have when considering Social Media marketing is: Which channels/platforms are best? With limited resources and several platforms to choose from, it’s important to focus efforts in the right place. Here are the results indicating the most popular Social Media platforms for travel agencies and advisors. So what are the headlines? Well, despite what we know about the power of visuals in marketing travel, Instagram sits in second place behind the mighty Facebook. But the gap between Facebook and the rest is stark. Almost every travel agent or advisor has a Facebook presence. That may say more about Facebook’s dominance than anything else. But it perhaps misses the fact that millennials are abandoning Facebook by the million and switching onto other networks. This generation is, as we have discussed before, hugely into travel and has growing buying power. And that’s before we mention the coming tsunami that is generation Z. So let’s take a closer look at the stats. Facebook is by far the dominant social media platform when it comes to the travel agency community. 97% of respondents confirmed that they use it for their business. Instagram (60%) and LinkedIn (59%) came in second and third respectively. Twitter was used by 38% of respondents followed by YouTube at 28% and Pinterest at 26%. Again here we see that the travel industry as a whole is neglecting the opportunity to tap into Social Media networks most frequented by younger travellers. That YouTube is the focus of efforts for just 28% of the industry is a big surprise, particularly given its size as a platform and its emphasis on inspirational video content. The compelling nature of visuals comes to the fore with a stat released by Travel Market Report’s: Agents that said they had sold at least $25,000 via social media in the past year were statistically more likely to use Instagram (72%) than the overall population. How Are Travel Companies Using Paid Advertising on Social Media? With so much uncertainty around the use and effectiveness of Social Media to sell travel, it’s not surprising that the percentage of travel companies not running paid adverts is significant: Around half don’t run any kind of paid campaigns. Travel advisors are less likely to engage in paid advertising on Social Media than agencies, but for those that do, Facebook dominates again. 61% of agencies that run paid ads do so on Facebook. 44% of advisors do the same. Despite being the go-to platform for millennials and dedicated to visuals, Instagram was used on a paid basis by 10% of advisors and agencies. 5% of both groups said they used paid adverts on LinkedIn, perhaps due to having a focus on business-related travel. It’s also where professionals with money to burn tend to congregate. Only 3% of advisors and 1% of agencies used paid advertising on YouTube. Is that the definition of untapped potential? There were some really interesting statistics in there. More travel professionals than we expected couldn’t tell you what a hash tag is. Few utilise SEO tactics in their Social Media campaigns. Facebook is dominating the efforts of many despite it being left behind by the younger generation. There’s also an obvious shortage of travel agents and advisors who go into Social Media with a plan in mind or any intention to track lead generation and progress. Without those key foundations, it’s difficult to make progress and adjust your methods to improve results. It’s also difficult to build consistency unless you have a structure in place. And that’s key to growing any type of community following. But plenty are ahead of the curve and doing things right. Below are the bookings per month made, on average, by agencies and advisors through Social Media platforms. You can expect these figures to rise in the coming years as travel industry professionals get to grips with how best to harness the power of Social Media. Heading into 2019, one trend in the industry that we’re keeping a close eye on is the desire for more sustainable, environmentally-friendly travel options. Sustainability means different things to different people. For some it’s a case of recycling and using public transport, for others it means going full Vegan and never setting foot in a car again. The sad fact is that air travel is one of the most destructive consumer habits, at least in terms of its carbon footprint. But let’s face it: It’s not going to stop anytime soon, particularly as the global travel industry relies so heavily upon it. Instead, travellers are looking for operators, accommodation and experiences that have a sustainability ethos in line with their own environmental ethics and concerns. This might mean finding an activity to do in another country that goes hand in hand with conservation: volunteering at a monkey sanctuary, planting trees, that kind of thing. But, as we explored last summer, the wider industry is slowly waking up to a simple truth: protecting the natural world goes hand in hand with the travel industry’s long-term future. Because of that, hotels and airlines are taking steps to make their operations greener. Last year, Alaska Airlines became the first airline in the US to ban straws on its flights. RyanAir pledged to become plastic free by 2023 as part of a five year ‘Always Getting Better’ plan. Hilton announced plans to eliminate the use of straws in all of its 650 global accommodations, as well as plastic bottles from its conferences, by the end of 2018. So things are going in the right direction, particularly with regards to single-use plastic waste – so often an unnecessary luxury that the majority of travellers can do without and won’t miss too much. Which brings us to wet-lease specialist Hi Fly. The Portuguese company is a go-to organization for airlines when they need extra capacity in the short to medium term or during peak season, as well as an on-demand carrier for government officials and defence personnel. The Hi Fly brand is operated by two affiliated airlines, one based in Portugal and the other in Malta. To top off all of that positive environmental travel news in 2018, at the end of the year Hi Fly operated the first-ever passenger flight without a single single-use plastic item on board. The ‘plastics-free’ trial involved four flights by Hi Fly’s Airbus A340. The first flew into the history books on December 26th when it took off from Lisbon on its way to Natal, Brazil. Over 700 passengers took part in the trial overall. Hi Fly President Paulo Mirpuri said the move was just the beginning, as part of the airline’s wider environmental ambitions. “This historic Hi Fly flight, without any single-use plastic items on board, underlines our commitment to making Hi Fly the world’s first ‘plastics-free’ airline within 12 months,” he said. “We take that commitment very seriously. We are obviously excited and delighted that Hi Fly will be the first airline to attempt such a feat.” – Hi Fly President Paulo Mirpuri. It may well be that Hi Fly’s relatively small operation makes it a lot easier to make these kind of wholesale changes. Having said that, its bigger competitors have reacted to the news with similar commitments. As touched upon earlier, RyanAir’s five-year plan to become “the greenest airline” will soon mean “initiatives such as a switch to wooden cutlery, bio-degradable coffee cups, and the removal of plastics from our range of in-flight products,” according to chief marketing officer Kenny Jacobs. Rival easyJet also confirmed this week that they are “currently introducing new hot drinks cups which use a plant-based lining and are compostable and replacing plastic drinks stirrers and spoons with wooden alternatives,” speaking to Telegraph Travel. The human footprint left behind at some of the world’s most popular travel destinations is bad enough. But the trouble with plastics and their increasing concentration in our oceans is that they are likely to wash up in all sorts of places. Single-use plastics, such as shopping bags and drinking straws, represent the epitome of our globalised, consumerist world: Cheap enough to make and use to be totally disposable, but everpresent and totally non-biodegradable. The result is that they clog up the very places travellers want to travel to. Not to mention their impact on the natural world. One million seabirds die each year die from ingesting plastic, for example. “Our corporate mission is based around sustainability and we work hand in glove with the Mirpuri Foundation to make sure that our corporate practices match our wider responsibilities to the planet,” says Hi Fly President Paulo Mirpuri. Pedro Ramos, the Director-General of Tour operator Alto Astral, the company who chartered the flights between Lisbon and Brazil, said he was delighted that his company had participated in what amounts to a small but key industry event. “All together for a better world, we say.” – Pedro Ramos, Director-General of Tour operator Alto Astral. So what does plastic-free mean in reality? Well, among the many single-use plastic items that have been replaced are cups, spoons, salt and pepper shakers, sick bags, packaging for bedding, dishes, individual butter pots, soft drink bottles and toothbrushes. Put that way, you can see why making the shift across a huge airline is going to be a big task. Finding the right suppliers around the world is no mean feat. But at the same time, it’s also a sign of how small changes can make a big difference. Hi Fly’s environmental team used bamboo cutlery, no shortage of paper packaging and containers that, once used, could be easily composted. The first plastics-free test flight was Hi Fly first major step to making its entire fleet ‘plastics free’ by the end of 2019. For the global players in the travel industry, these steps are tricky to implement but easy to justify. And with a groundswell of traveller opinion in support of moves just like this, hopefully all of our travel will be looking greener in the near future. Traditional marketing saw companies aim to hit the jackpot, make that perfect ad and sell you their product in an instant. Even if they left you with little more than an annoying, unforgettable jingle, they succeeded. The seed was planted. But that was advertising before the internet. In the dawn of the information era, where everything is accessible to customers and catchy jingles no longer swing sales to the extent they once did, companies must develop new methods to be discovered and remembered by customers. Discovered is the key term there. Particularly in the case of the travel industry. We know that smaller travel agencies struggle to compete against the industry’s big players. And that a handful of platforms dominate search engine results and therefore bookings. That’s the downside to having a system that allows well-funded companies with astute business models to gain a global stranglehold. It’s tough on startups, but everyone has to start somewhere. But it’s also an opportunity. A frenetic market has its own possibilities. We know that the majority of travellers are now researching, planning and booking trips online using every device you can imagine. Smart TVs, mobile phones, tablets and laptops. Even voice assistants. In part that’s out of convenience. These devices are now our gateway to the online world. It’s also because E-commerce is more trusted than it was. Not to mention the sheer amount of content and travel guides online. Organising your travel experience online has become a no-brainer. However, this move toward digital has a downside: It’s hard for travel agencies to grow and get noticed when people have so many potential options for flights, accommodation, tours and more. Especially when a small number of players dominate the online travel game. SEO has long been a major determinant of lead generation. However, Google’s Adwords platform provides a way for operators big and small to bypass all of those SEO hoops and put their links directly in front of potential customers. Google is comfortably among the most popular websites in the world, with 28 billion visits every single month. Its many travellers’ gateway to the internet. So generating leads through the search engine – whether through organic SEO or by paying for them using the Adwords platform – is vital if a travel agent wants to survive and thrive. British travel agent Secret Escapes is seeking to solve these problems through the use of machine learning. Hang on, you might be thinking. What is this vaguely AI-related buzzword all about? Well, very briefly, machine learning is a type of artificial intelligence that uses algorithms to scan huge piles of data in search of patterns and trends. Patterns and trends that a human couldn’t otherwise spot. It’s being applied already in the travel industry, it’s being used for various things, from fraud detection to developing intelligent travel assistants. You get the idea: Machine learning is capable of doing a lot of the heavy lifting in a short time frame. Secret Escapes thought they could use the technology to reduce their CPL. The membership-only online travel agency, which specialises in luxury packages, decided to adopt a Google Ads Smart Bidding approach called tCPA, or Target Cost Per Acquisition. This is a dynamic, automated approach to bidding that uses advanced machine learning to optimise bids automatically, and tailor bids to each auction. The test started in Google AdWords’ Draft & Experiments with a seven-day learning phase, then continued until the results reached significance. The team tested across multiple markets at the same time so they could compare outcomes and collect more insights. When the test was complete, they found that using tCPA bidding on average produced a 23% better click-through rate, 65% more conversions and an overall cost per lead that was 38% lower than their previous bidding setup. In some accounts, they even saw 100% greater impression volume. So what do those numbers mean in practice? Well, no doubt a 23% better click-through rate granted the company’s products and packages significantly higher exposure than they would have done otherwise. The devil in the detail also suggests that the ads were improved in the sense that they were better targeted, too. Which of course contributed to a whopping 65% more conversions. A 38% lower CPL is also music to the ears of any marketing boss. Rumyana Miteva, Head of Search at Secret Escapes was certainly happy with the results. “Machine learning is evolving and automation within Google Ads is getting better and better, which give us the confidence to continue using automated bidding at scale,” she said. Secret Escapes have proved that you don’t have to spend a fortune to get great results through GoogleAds. And there’s certainly a lot to be gained from using the platform cleverly. However, here at Travelshift we favour a more organic approach to winning business. Our marketplace software empowers small operators to dominate their travel niche by banding together, creating awesome content and connecting travellers with the information they need and local experts. It’s packed with tools and pre-made solutions to help your marketplace get off the ground and seamlessly attract both buyers and sellers. It all adds up to a software platform that naturally creates the quality and quantity of content that search engines seek out. Not to mention an informative, go-to source for those curious about your travel niche or chosen destination. You can find out more about our marketplace software here. Or contact us today to find out how our software can provide the foundations for your travel industry ambitions.